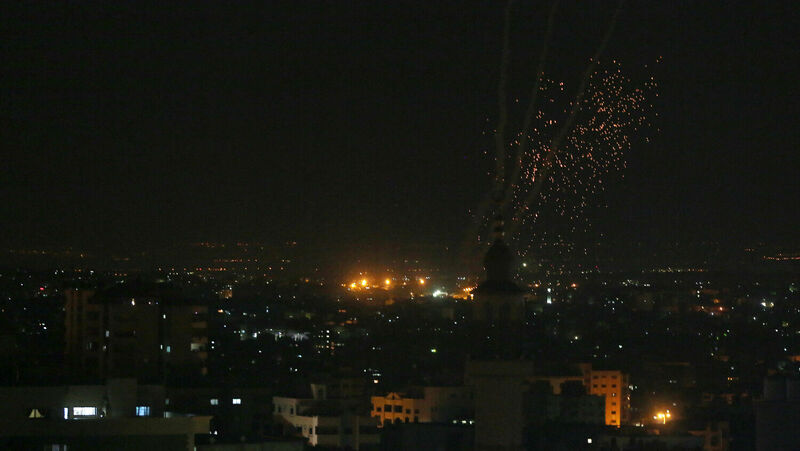 Rockets fired by Palestinian militants toward Israel are seen from Gaza City. An Iranian weapons shipment bound for Hamas was seized by an Islamic State affiliate in the Sinai Peninsula. Kuwaiti newspaper Al-Jarida reported on November 24 that the shipment was the largest ever seized by the Islamic State and it included Russian-made, laser-guided Kornet anti-tank missiles and other guided weaponry. Its use of a Kornet missile is strong evidence that although the Islamic State intercepted the recent shipment, previous shipments of missiles had made it into Gaza. Prof. Barry Rubin said in Global Politician that Iran pushes its influence in the region by “the promotion of client groups.” Alongside Hezbollah, Hamas has consistently been the other of Iran’s two most important clients. In 2014, Israeli Navy commandos intercepted a ship in the Red Sea carrying an Iranian arms shipment to the Gaza Strip. The shipment included several dozen advanced missiles hidden in shipping containers that were also carrying sacks of concrete. The Syrian M-302 missiles aboard carry a payload of up to 375 pounds and have a range of up to 125 miles.